Welcome to South Decatur, home of the Cougars! We are a combined junior and senior high school in Greensburg, Indiana. As part of the Decatur County Community Schools, we serve about 475 students in seventh through twelfth grades. 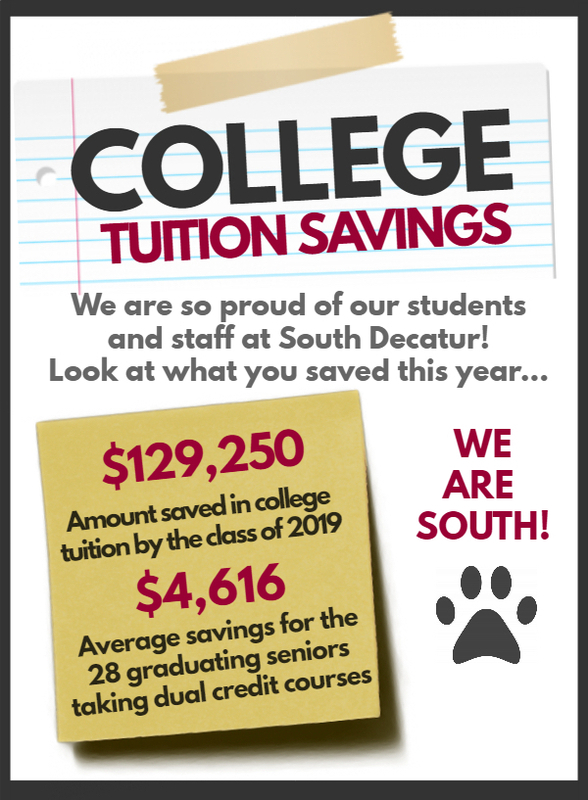 At South Decatur, we’re preparing our students for success after high school, whether they choose to further their education or go straight into the workforce. We invite you to get to know our award-winning school and all the programs we offer our students. Please feel free to contact us if you have any questions. We look forward to hearing from you! At our High Reliability School, we put our students first. At South Decatur Jr/Sr High, students aren’t just students; they’re a part of our family—our community. Here, our educators work hard to create a positive and supportive environment where learning is relevant, rigorous, and engaging. We offer a multitude of vocational, dual credit and AP courses, and Project Lead the Way programs (engineering and biomedical science) to assist our students in becoming college and career ready. Many of our students graduate with certifications that propel them into adulthood. I would like to thank you for visiting our website and for being part of South Decatur. Please take a moment to tour our site and learn why South Decatur High School is the best school for your student! South Decatur High School is having a yard sale on Saturday, May 18. We are currently looking for subs to work in the South Elementary and South High School cafeterias.